The Peninsula campaign of 1862 was the largest campaign of the Civil War. More men were assembled on the Virginia Peninsula for this battle for the capital of the Confederacy than for any other operation of the war. Now Stephen Sears, the award-winning author of Landscape Turned Red, provides the first complete, full-length account of the campaign ever written, a masterly narrative by one of our foremost historians. The Peninsula campaign was General George McClellan's grand scheme to advance from Yorktown up the Virginia Peninsula and destroy the Rebel army in its own capital. 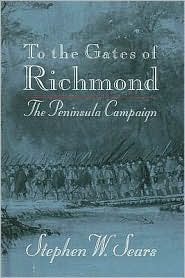 Though initially successful, McClellan's plans fell through at the gates of Richmond. Assuming command of the Confederate forces, Robert E. Lee split his army and proceeded to deliver a series of hammer blows against the Federals. Though the Confederates were not invariably victorious on the field, Lee's will to fight so surpassed McClellan's that in the end the Union forces were expelled from the Peninsula. Weaving together narrative, military analysis, and firsthand testimony from the diaries and letters of Union and Confederate soldiers, Stephen Sears has crafted a magisterial history. It is at once a ground-breaking study of the great Civil War engagement, an unforgettable picture of men at war, and a sobering reflection of the role of individuals on the outcome of events. The Peninsula (or Peninsular) Campaign was the main offensive by Union troops in Virginia in 1862. George B. McClellan was a commander of the Union forces in the early part of the Civil War, much criticized for his extreme caution. Richmond, Virginia, loated on the fall line of the James River, is the capital of the Commonwealth of Virginia and served as capital of the Confederate States during the Civil War. Robert E. Lee was served in the United States Army in Mexico and led the Confederate Army in the Civil War.